Australian Foreign Minister Kevin Rudd had to talk himself out of trouble after airport officials flagged up a suspicious liquid in his cabin baggage - a jar of Vegemite. Mr Rudd was heading to New York from Mexico City when he attracted the authorities' attention. He explained that the dark brown paste was his breakfast and, with help from local diplomats, was allowed through. Vegemite, a savoury paste made from yeast extract, is popular in Australia. It is similar to Marmite, which is widely eaten in the UK, but is hard to buy in many countries. "Only problem travelling to NY is that they tried to confiscate our Vegemite at the airport. 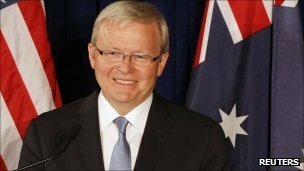 Needed Foreign Ministerial intervention," Mr Rudd tweeted. "Airport staff were surprised when I said it is good for you and I ate it for breakfast. They then waved me through," he said. Travelling for Australians with Vegemite can be perilous. Mr Rudd said he needed his Vegemite to go with his toast!